The Sweet Adventures Blog hop theme this month is “What’s your cup of Tea,” and hosted by 84th and 3rd. A perfect opportunity to use my new muffin tin which I bought on a recent trip! 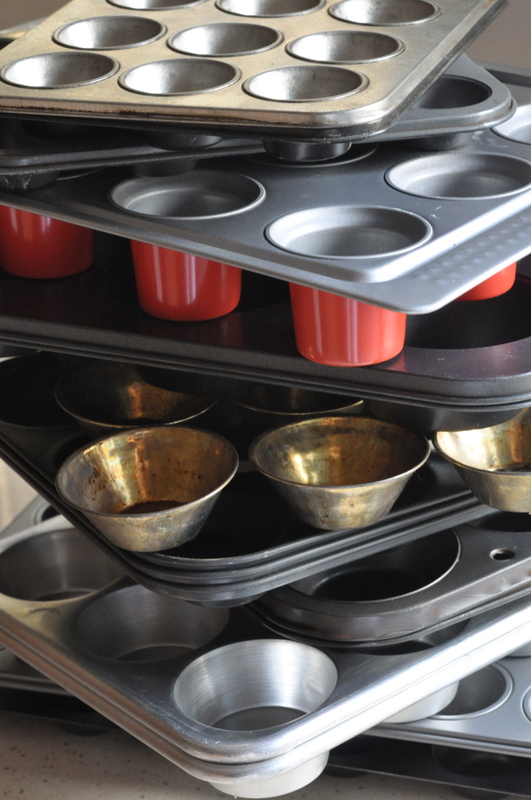 Why buy another cupcake or muffin tin when I already have so many? Well, the shape caught my eye! Baked muffins and cupcakes in this cake tin take on a different appearance, tall and narrow with some having domed shaped tops depending on the recipe being used! What ever way they come out they all look really cute! With some lime green cupcake liners (also my new muffin pan), matcha tea in the cupboard and lemons in the fridge, it was decided… matcha tea with lemon cupcakes! 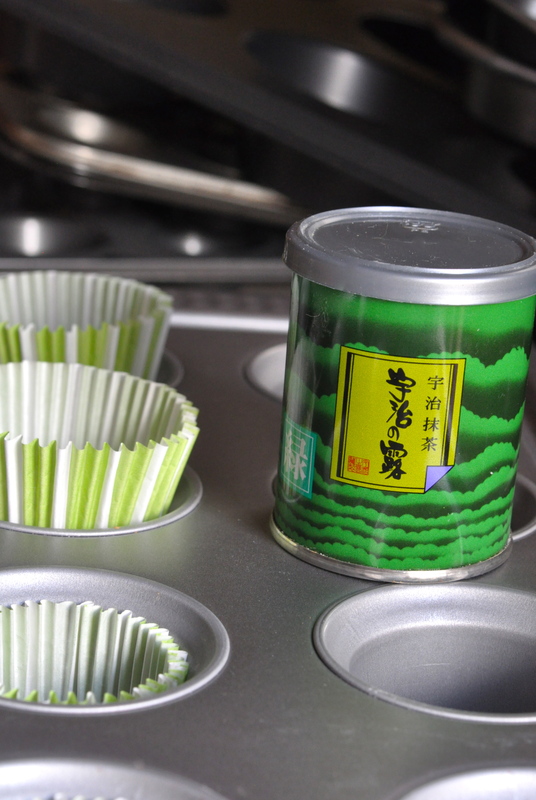 Matcha tea is a high quality Japanese green tea which has many health benefits, guess using this in the cupcake recipe is a good thing… might just think these cupcakes are really good for my health… right! My matcha tea probably could have been fresher, it had been already opened for a few months and the powder was not as green as when first opened, guess I will have to stock up again and use the older matcha tea for this face mask! Usually I buy matcha tea from Asian supermarket which is beside the Oriental supermarket, both opposite the Central Market for those living in Bahrain. Note: These cupcakes have a light flavour of matcha tea (I am not the green tea drinker in the house), but you can increase the flavour (and colour) by adding another 1/4 teaspoon of matcha tea into the buttercream frosting. Pre-heat the oven to 180°C/350°F/Gas 4/Fan 160°C. Add the butter, caster sugar and lemon zest into a mixing bowl. Sieve in the matcha tea. Using and electric mixer, beat ingredients together until light and fluffy. Add the beaten eggs (a few tablespoons at a time) to the cake mixture, beating well after each addition. Sift in the flours and fold into cake mixture with a spatula until the cake mixture is smooth, stir in the yogurt. Bake cupcakes for about 18 to 20 minutes or until middle of cupcake springs back when lightly pressed with fingers. Let the cupcakes sit in the baking pan for a few minutes before transferring to a wire cooling rack. Add the cream cheese and butter to a mixing bowl, beat together with an electric mixer until soft and smooth. Gradually sift in the icing sugar and beat until all the icing sugar is incorporated. In a small bowl mix the cream and matcha tea to a paste and then beat this into the buttercream. 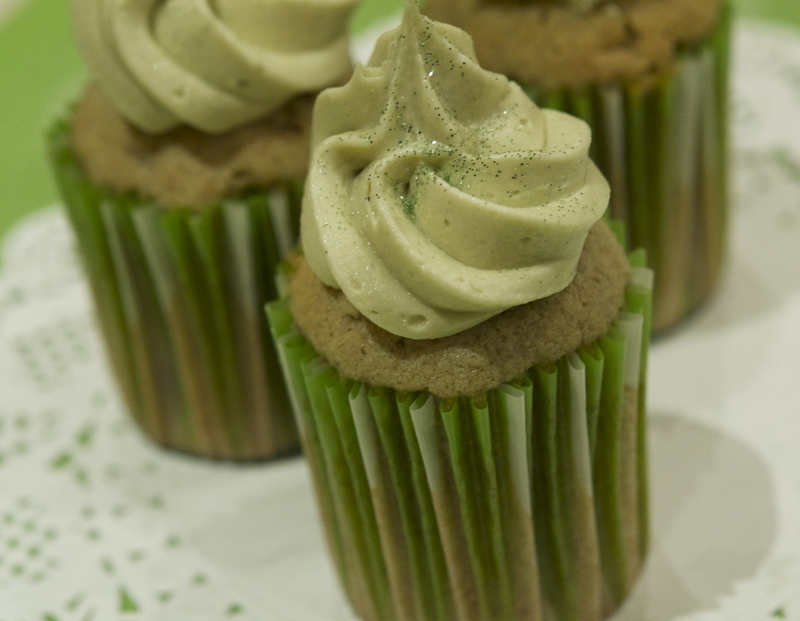 Spoon the matcha buttercream into a piping bag fitted with a rosette nozzle, pipe a small swirl on top of each cupcake. Dust lightly with edible glitter dust, if desired . 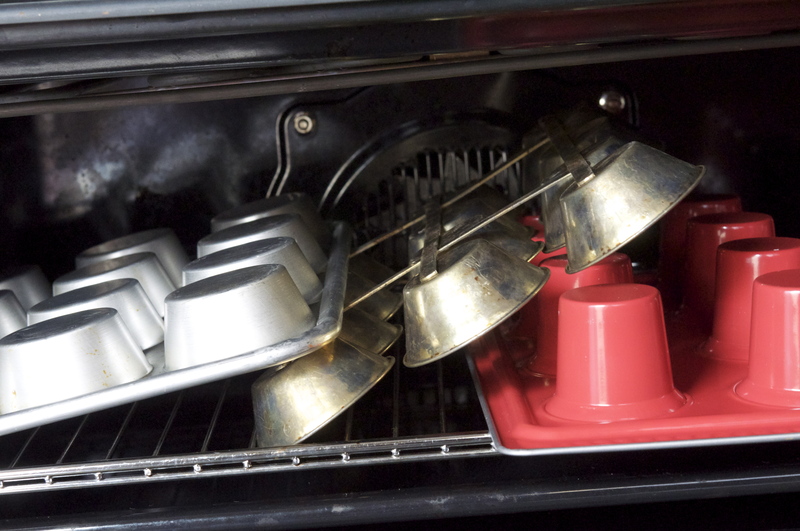 Tip: Dry your washed baking tins up-side down in the residual heat from the oven after baking, Mum used to always do this! The heat will dry your pans completely and stop rust forming on some pans. This post is part of the Sweet Adventures Australian Blog Hop, “What’s your cup of Tea,” click here to see all the other entries! Keep a lookout for more cupcakes and muffins using this baking tin! LOL! I better start practicing my stretches! Gorgeous cupcakes 🙂 I love the lemon/matcha combo. Thanks for joining the hop!! Love the flavours in these cupcakes and love the taller and narrow cupcakes – gorgeous! Your cupcakes are cute! Looks like cupcakes yet different. Where did you find the pan? Yes, there is an Ikea in Kuala Lumpur. I think I’ll hop over this weekend and look for the tins. Thanks! Great that you have an Ikea near you and I hope they have them in stock! Your cupcakes look so adorable Moya! I love the taller and narrower shape. Does this mean I can have more than one 😀 By the way, I love your tip for drying muffin tins upside down. I will have to try this! Look at all your tins – fab! You and I used exactly the same brand of maccha – how funny. The addition of lemon sounds wonderful and the tall cakes look great!